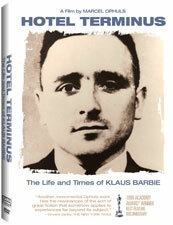 A brilliant and epic Academy Award-winning examination of the Nazi SS officer Klaus Barbie, the infamous "Butcher of Lyon", HOTEL TERMINUS: THE LIFE AND TIMES OF KLAUS BARBIE weaves together forty years of footage and interviews culled from over 120 hours of discussion with former Nazis, American intelligence officers, South American government officials, victims of Nazi atrocities and witnesses. Barbie, while Gestapo chief in Lyon, tortured and murdered resistance fighters, including Jean Moulin, Jewish men, women and children, and had thousands deported to death camps. After the war he was protected by and worked with the U.S. Army and American intelligence officers, and then allowed to hide in Bolivia, where he lived peacefully for 30 years as a business man under the moniker Klaus Altmann. Only in 1987 was he brought to trial in a French courtroom in Lyon for crimes against humanity thanks to the efforts of Serge and Beate Klarsfeld. In Geneva, Switzerland, film directors Marcel Ophuls and Jean-Luc Godard meet for a surprisingly intimate and sometimes contentious dialogue.